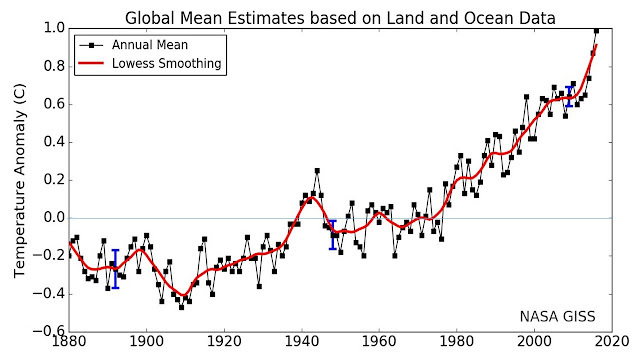 Global temperatures have risen over the past 200 years. The following slide shows the temperature trends. 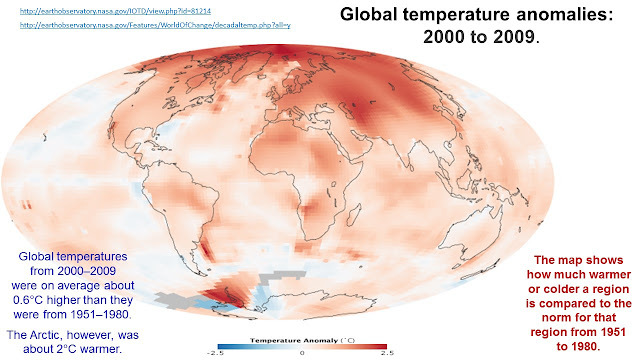 Data is expressed as temperature anomaly - this simply means that the average temperature between the years 1950 and 1980 is taken as the reference temperature. Temperatures in other years are measured relative to this reference value. The volume of ice is obtained by multiplying its thickness by ice covered area and is a direct measure of total ice present. The following slides show how these parameters have been changing over the past 40 years. The first slide shows the area covered in ice (old and new) and how this changes over the course of the year. 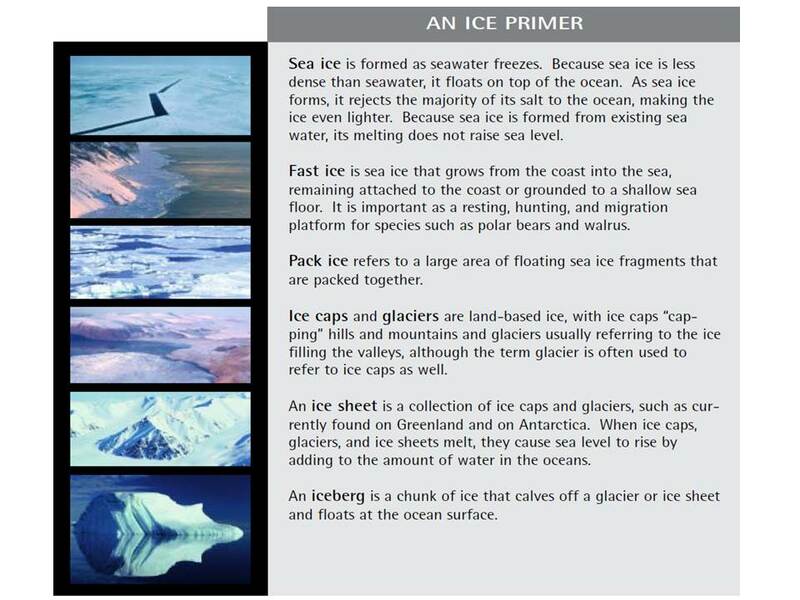 Other slides show the volume of ice and how it has changed since 1979. 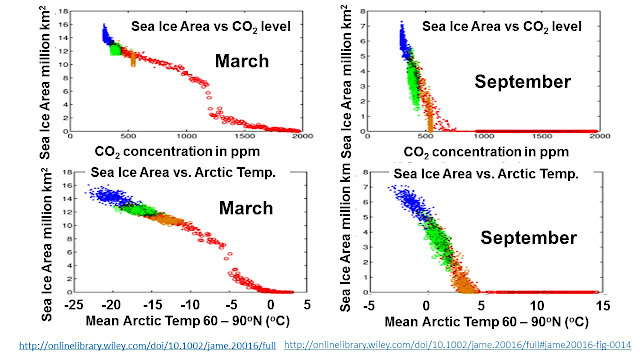 The graphs show that loss of Arctic sea ice has been equivalent to 3000 km3 per decade. Put it another way, Arctic has lost over 12 trillion tons of ice since 1980! (1 km3 ice weighs a billion tons). 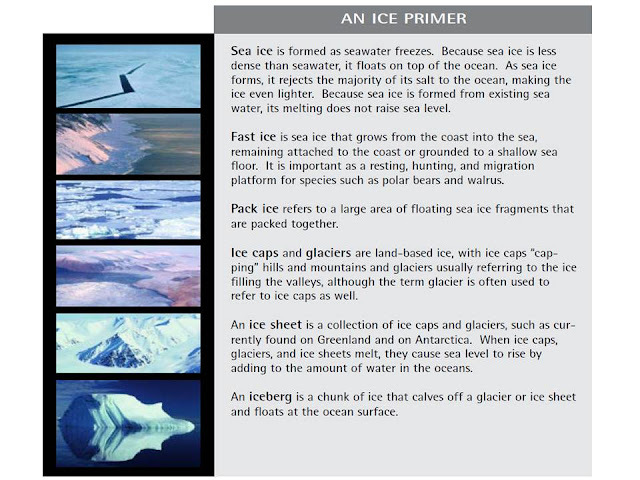 Molten ice converts into water - in the Arctic, the ice is floating on water already and melting does not affect the sea level. It is the ice that is located on solid ground - mainly on Greenland - that on melting, will add new water to the ocean and result in sea level rise. The ice sheets in Greenland are relatively stable (although they have been losing ice at a rate of 140 billion tons per year). However, parts of the glaciers that are sticking out beyond land are in contact with warmer sea water and are melting faster and also moving faster. Loss of such glaciers will take away the blocking effect on the movement of glaciers further inland and will accelerate their journey to the sea. This is expected to happen in due course, but not imminently in the next few decades. The energy required to melt such large quantities of ice is enormous and is supplied by the redistribution of energy that the Sun radiates on our planet. Vast quantities of solar power reaches Earth's surface - 164 W/m2 averaged over 24 hours. Equatorial regions receive most of the energy but this gets redistributed to polar regions by atmospheric and ocean currents. As part of the natural annual cycle, about 16,000 km3 of ice is lost every year from April to September in the Arctic sea. Taking the density of ice as 1000 kg/m3, the mass of ice lost per year is 16 x 1015 kg. The latent heat of ice is 333 kJ/kg – it takes 333 kJ of energy to melt 1 kg of ice. Energy required to melt the arctic ice is 333 kJ/kg x 16 x 1015 kg = 5.33 x 1021 Joules. For comparison, the U.S. Energy consumption for 2009 was about 1 x 1020 J. It takes about 50 times the annual U.S. energy consumption to melt the Arctic ice every year. 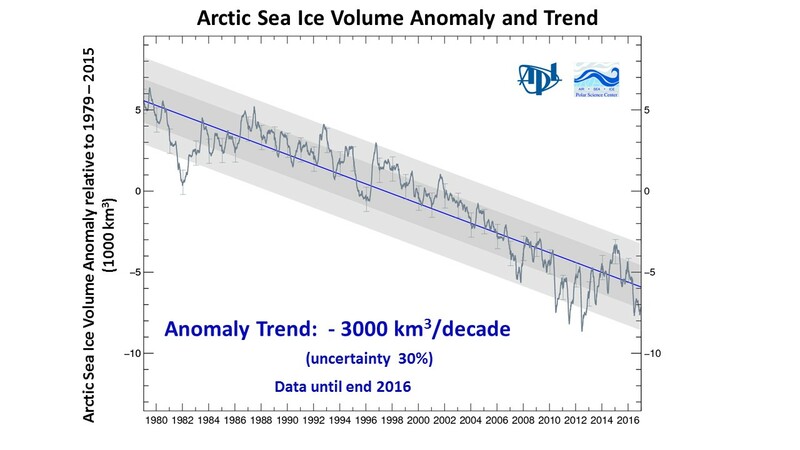 The loss of sea ice due to warming Arctic was estimated as 300 km3 per year which is equivalent to about 20% of ice lost annually between April and September - this means that a fifth of the ice lost in the summer is no longer replaced in the winter months. This corresponds to 1021 Joules of energy absorbed by the Arctic sea from the atmosphere and the ocean currents. This energy is stored in the water and goes to raise the temperature of the sea. Let us look at the science to understand why the Arctic has been warming up faster than the rest of the Globe. Global climate is determined by a complex interaction of many processes. To change a huge system over a period of time, some type of positive feedback mechanism is generally required - something that takes the system away from a condition of stability to a new condition (1, 2, 3). In positive feedack, a small change in one parameter causes other changes which then amplify the magnitude of the original change. This step is repeated to make the overall change significant. I describe the processes that might be responsible for Arctic warming in the following. 1. The Albedo Effect: It is a classic example of positive feedback operating in the climate system. See also. 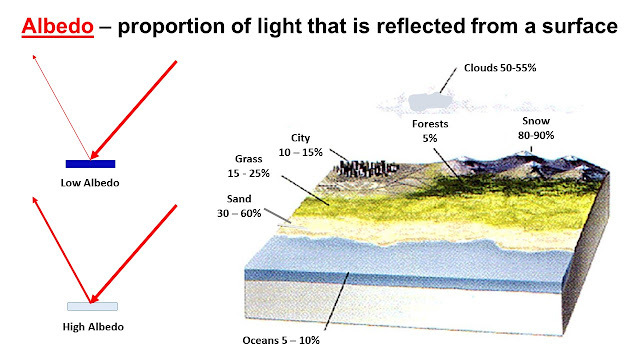 Arctic ice is highly reflective and sends a good fraction (about 90%) of sun's energy back into space. On melting, ice is replaced by darker looking water which reflects less light (5 to 10%) and absorbs more of the incident energy causing additional warming. This warming then melts even more ice which then results in still greater absorption of solar energy. And so the cycle goes on, feeding on itself. 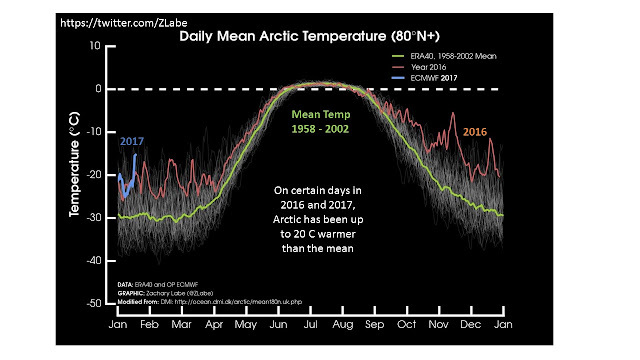 We can make a rough estimate of the extra heat energy that a change in albedo might deliver to the Arctic sea. 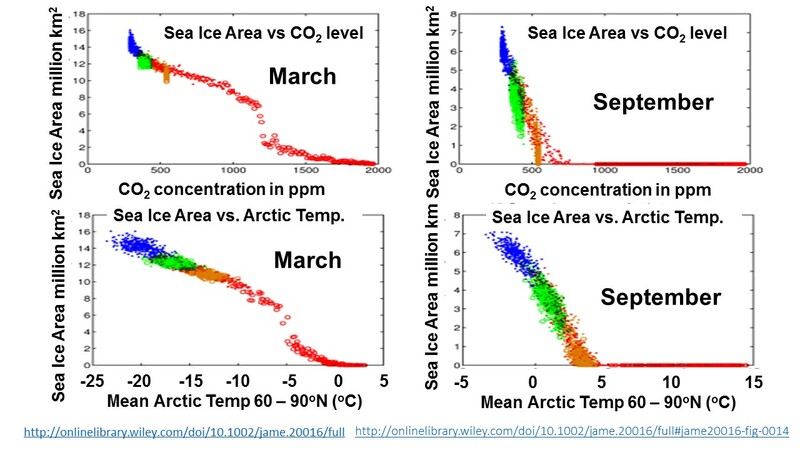 Melting of the ice causes a loss in albedo from 0.9 to 0.1 - a reduction of 0.8 (instead of 90%, only 10% of incident solar energy is reflected to space). From measurements of ice extent (see slide), each summer 107 km2 (or 1013 m2) of arctic ice is changed to water. Over this area, change in albedo traps 2 x 1021 J energy into the sea water. 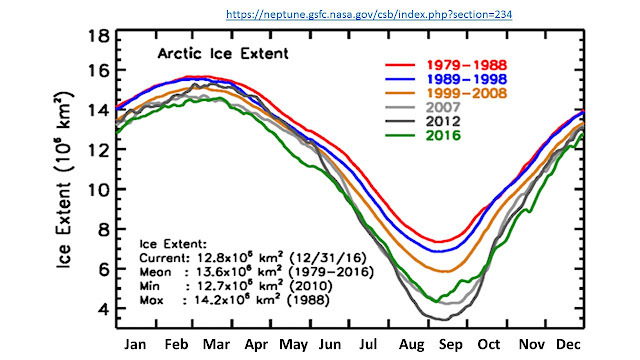 This is within a factor of 2.5 of our estimate of the energy required to melt the ice in the summer months. 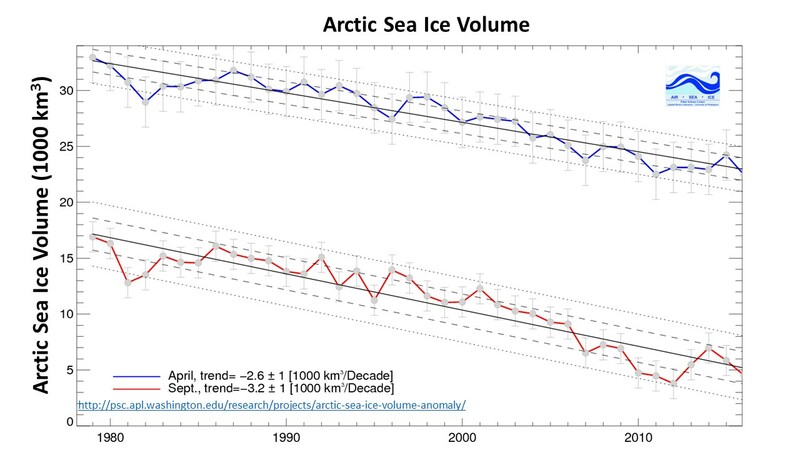 It seems to me that the albedo effect is responsible for the loss of a good part of sea ice in the Arctic. 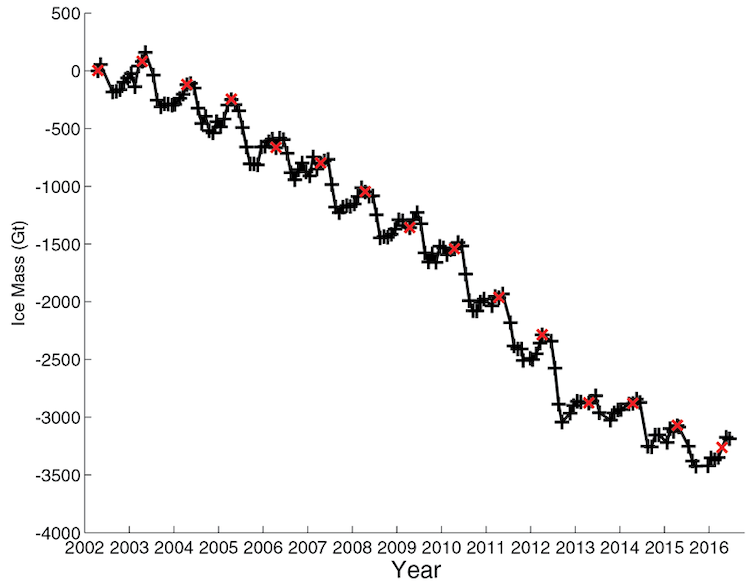 With positive feedback, as more of the sea ice disappears, the albedo effect will cause even greater ice loss in successive years. Burning of fossil fuels produces black soot which is carried by winds to the Arctic. The soot in the atmosphere increases absorption of solar light further warming the region. Some soot precipitates on the ice and darkens it. 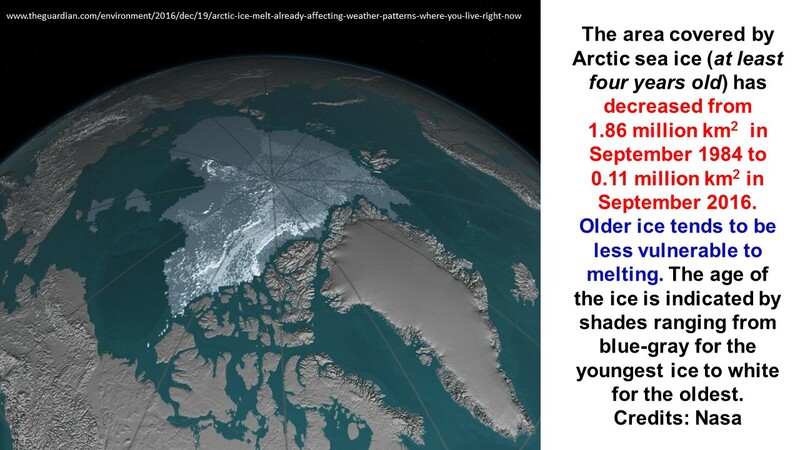 Darkened ice has lower albedo - less of the sunlight is reflected, increasing warming. 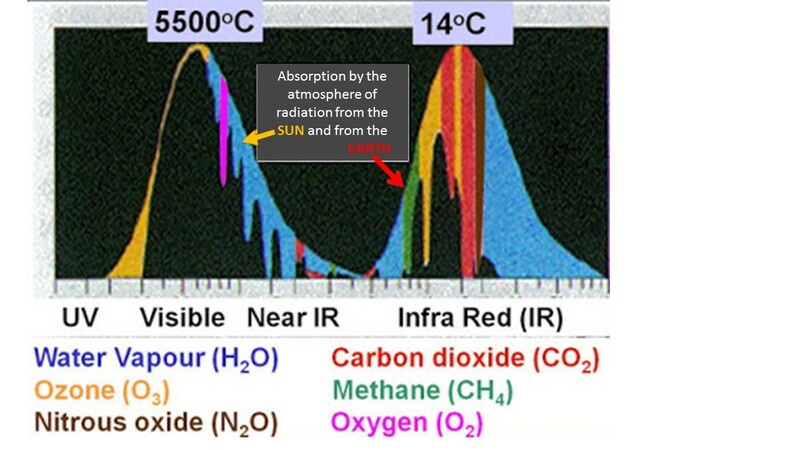 Increased amounts of water vapour and carbon di-oxide in the atmosphere also trap reflected energy. 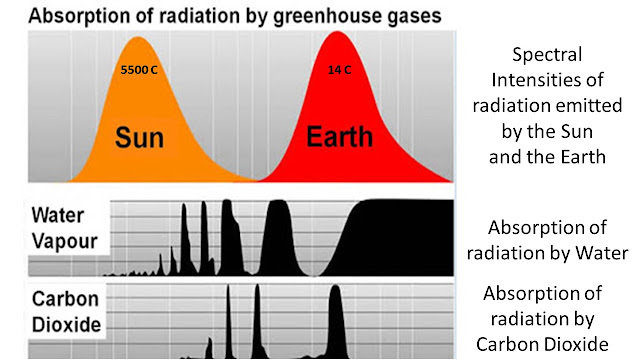 Trapped energy goes directly into heating the atmosphere and not in evaporation (as is the case at lower latitudes). This causes Arctic air temperature to increase faster than in the rest of the globe. An interesting bye-product of reduced ice cover in the Arctic is the higher vapour pressure of water which can result in increased snowfall during the winter months. 3. Stronger Thunderstorms are Transporting More Energy to the Arctic: Research at NASA points to the excess amount of energy that is being transported to the poles by large weather systems. Even though the frequency of thunderstorms has not increased, they are stronger and bring lot more energy to the polar regions. Obviously much more work is required to quantify this effect but it is felt that this may be quite important. The summer ice cover is lowest in September and the model predicts that Arctic will be ice free when the mean temperatures in the 60 to 90 degree latitude North reach above 5 degrees centigrade and this might happen for CO2 concentrations of 700 ppm. 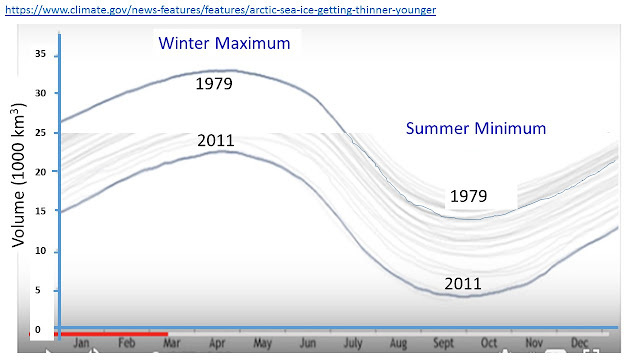 The winter ice cover will vanish for CO2 concentration levels of 1500 ppm or higher. Arctic Circle climate is an integral part of the global climate system and the more extreme changes in the Arctic Circle will affect the climate of the world. The impact of a warming Arctic has been the subject of an extensive report that is available on the Web. I refer you to the report for a detailed (146 pages) analysis. In the following I discuss a few points only. Changes in northern hemisphere climate: Arctic temperatures are rising at least twice as fast as other regions of the Earth and causing accelerated loss of Arctic sea ice - in extent, thickness and age. This will influence atmospheric and ocean circulations and weather, particularly in the northern hemisphere. The temperature and rainfall patterns shall change, and their effect on forests, agriculture, water supplies etc will be significant. Gulf Stream: Gulf stream brings warm saline water from the tropics to the north. Melting ice and increased river run-offs have added large quantities of freshwater to the North Atlantic ocean. This reduces the salinity and hence the density of sea water. It is likely that this will affect the ocean circulation pattern with major impact on the climate of regional areas - for example - Gulf Stream might change course or stop completely ushering severely cold temperatures to northern European countries. Permafrost: For thousands of years, permafrost (frozen soil) and wetlands in high northern latitudes have stored vast amounts of carbon - they cover 9% of the land area but contain 25 to 50% of world's organic carbon. With warmer temperatures, permafrost will start to thaw and release carbon into the atmosphere as carbon dioxide and methane - two potent greenhouse gases. 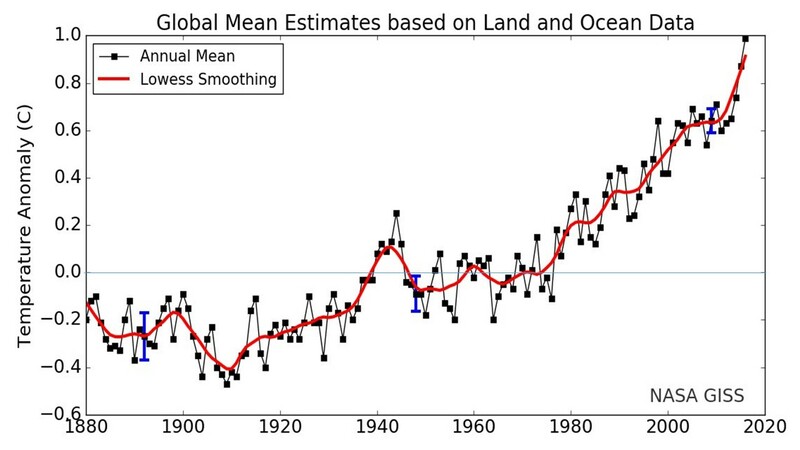 This can set up a positive feedback loop and contribute significantly to an accelerated global warming. Most climate models do not include permafrost thawing in their calculations. Permafrost's southern limit is expected to shift several hundred kilometres by the end of this century. Thawing of permafrost will weaken frozen coastal lines, increasing coastal erosion by the rising sea-levels. Vegetation will start to cover thawing permafrost in due course - it will be less reflective and increase warming. However, new vegetation will absorb more carbon di-oxide from the atmosphere counteracting some of the warming. Thawing of the permafrost will change the hard solid ground to soft marshy land. Buildings, bridges, roads built in the region will be destabilized and will have to be redesigned and replaced. This will be disruptive for the locals and very expensive. Ocean Acidity: Oceans have been absorbing vast quantities of carbon dioxide from the atmosphere and acidity of the oceans has increased by 30% in the past 100 years. Cold oceans absorb more carbon dioxide - Arctic is acidifying twice as fast as the rest of the oceans. Acidic water dissolves calcium carbonate, and therefore interferes with the development of coral reefs and the shells of see animals like oysters, crabs, snails, plankton etc. 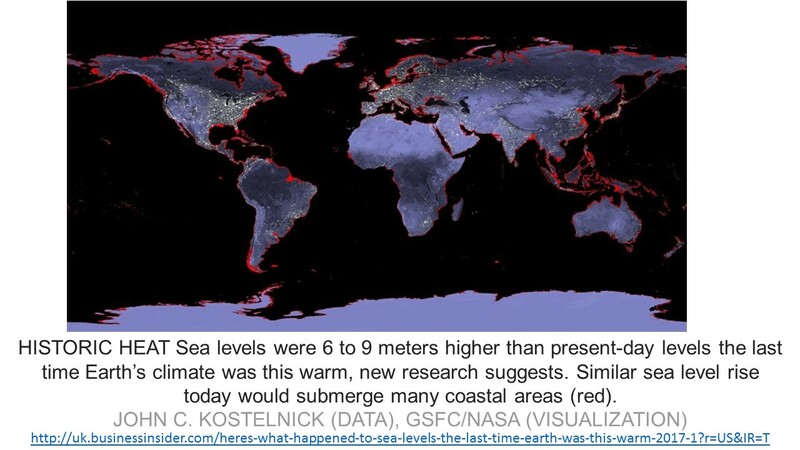 Sea-level Rise: Melting of arctic sea ice does not affect sea levels. However, ice sheets in Greenland have been losing water at increasingly higher rates. Historically, when the temperatures were as warm as they are today, sea levels had settled at much higher levels than at present. I hope to look at this question in a future publication but the following slide shows the effect on coastal areas due to the expected sea level rise sometime in the future. If global warming continues unabated then the situation could be much worse.